When I found out A was going to be a boy I started brainstorming about the nursery design. I don't remember what spurred the idea, but it didn't take me long to come up with a fun way to combine our love of woodies (the cars) with a cool roadside Americana vibe. Not to mention use stuff we already had on hand. Win - win. Since LJ had the surfer themed woody room as a baby, we decided A would get a "turf-er" themed woody room. Ba dum cha. It took me about 4 months to finish and then I had to maintain the cleanliness of the room long enough to take pictures to show you, so what you see here is about 9 months in the making. Ha! 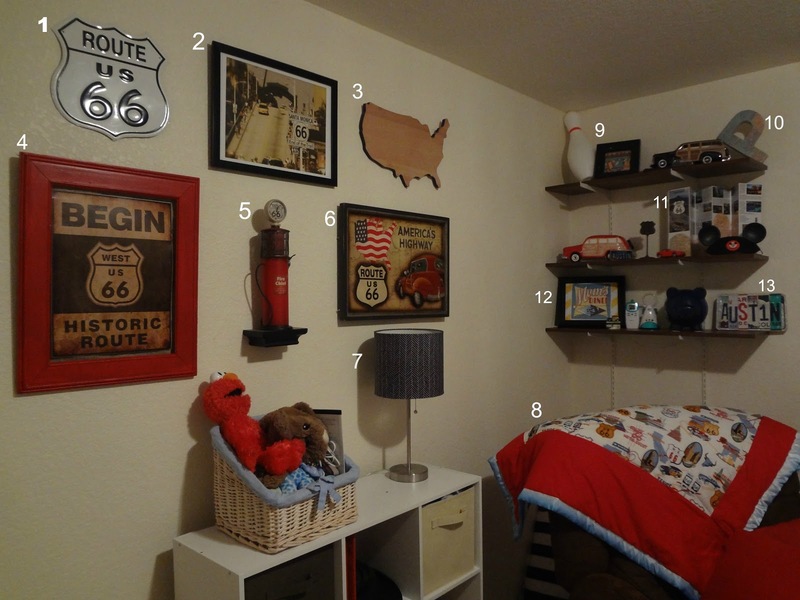 Without further adieu, baby A's Route 66 nursery! Chair: Bass Pro Shop - only $299 and it is the most comfortable and amazing chair! Big enough for my 6'3 husband and cheaper than a lot of nursery gliders I looked at. It's called the "Catnapper" and it lives up to its name. I fall asleep in it regularly while putting the baby to bed. Wall hanging: Made by me using vintage state postcards I ordered online. This was in lieu of a $50 poster I saw online that had a similar wooden backdrop, vintage map design. I may have to spring for the poster one of these days. Shutters: I can't say enough about using shutters for decorating. Can you tell the furniture (look at the right side of the crib) is a well-loved hand me down from the first child? I'd like to balance this wall a little better, but it works for now. It kind of stresses me out that the "N" is crooked in the picture. Don't worry, it's straight now. Can we talk about how much I LOVE these letters. I made them myself and love how they turned out! Really love. Like in a I-want-to-start-an-etsy-shop-and-make-them-all-the-time-but-I-won't-because-they're-probably-not-as-great-as-I-think-they-are kind of love. Basically I took a three-dimensional cardboard letters (I got mine at Hobby Lobby), painted the edges a navy blue to help them stand out against the light wall, google imaged "Route 66 landmarks," then printed out pictures that had the cloud vibe I was looking for, traced and cut them accordingly, and modge-podged them onto those suckers. I broke this one down by number in case anyone was DYING to know where something came from. 3. USA Cutting Board from Target - I waited until it was on super clearance and got lucky that it was still around! Hooray! Did you or do you plan to do a "theme" nursery/bedroom for your little one?